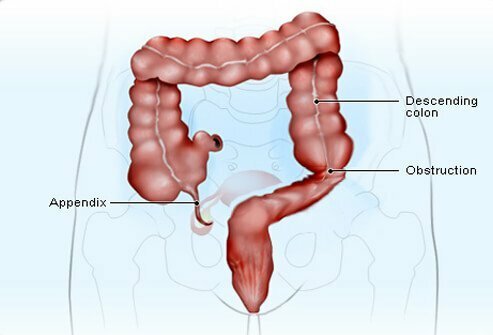 The appendix is a small, pouch-like sac of tissue that is located in the first part of the colon (cecum) in the lower- right abdomen. Lymphatic tissue in the appendix aids in immune function. The official name of the appendix is veriform appendix, which means "worm-like appendage." The appendix harbors bacteria. The suffix "-itis" means inflammation, so appendicitis is inflammation of the appendix. Appendicitis occurs when mucus, stool, or a combination of the two blocks the opening of the appendix that leads to the cecum. Bacteria proliferate in the trapped space and infect the lining of the appendix. If the inflammation and blockage are severe enough, the tissue of the appendix can die and even rupture or burst, leading to a medical emergency. Anyone can get appendicitis, but it occurs most often in people between the ages of 10 and 30. About 7% of people in the U.S. experience appendicitis during their lifetime. Very young children and elderly people are at higher risk of complications due to appendicitis. Early recognition and prompt treatment of the condition are necessary, especially in vulnerable populations. Delaying the diagnosis and treatment of appendicitis increases the risk of complications. 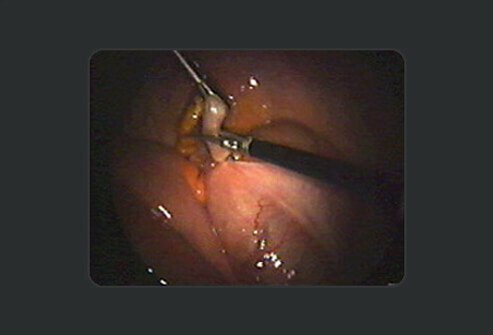 One potential complication -- perforation -- can lead to an accumulation of pus (abscess) around the appendix or an infection that spreads throughout the abdominal lining and that of the pelvis (peritonitis). Surgery should occur as soon as possible after the diagnosis of appendicitis. Longer delays between diagnosis and treatment (surgery) increase the risk of perforation. 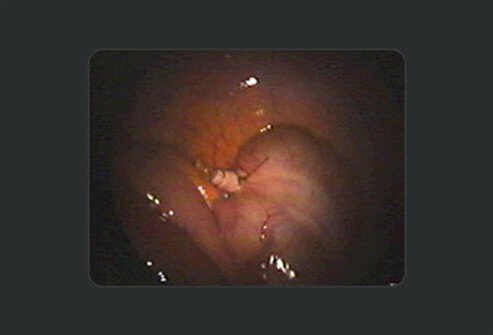 For example, the risk of perforation 36 hours after appendicitis symptoms first appear is 15% or more. Sometimes the inflammation associated with appendicitis interferes with the action of the intestinal muscle and prevents bowel contents from moving. Nausea, vomiting, and abdominal distention can occur when liquid and gas build up in the part of the intestine above the blockage. In these cases, the insertion of a nasogastric tube -- a tube that is inserted into the nose and advanced down the esophagus into the stomach and intestines -- may be necessary to drain the contents that cannot pass. One of the first symptoms of appendicitis is abdominal pain that is hard to localize. People with appendicitis typically experience pain in the central part of the abdomen that eventually moves over to the right lower quadrant. Loss of appetite is another early symptom of appendicitis. Nausea and vomiting may occur early in the course of the illness or even later as the result of an intestinal obstruction. Doctors diagnose appendicitis based on the patient's symptoms and findings during physical examination. A person with appendicitis usually experiences moderate-to-severe pain when the doctor gently pushes down on the lower right abdomen. A potential indication of peritonitis is "rebound tenderness," which is a worsening of pain when the doctor removes his hand after pressing down on a tender area of the abdomen. 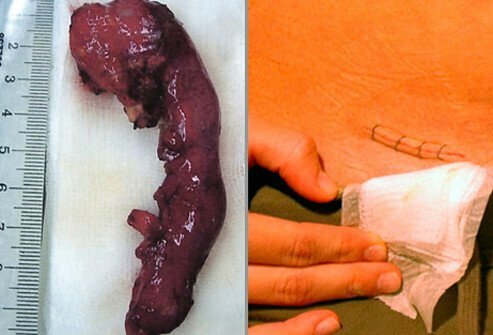 Surgical removal of the appendix is called an appendectomy. Antibiotics are given to a patient with suspected or confirmed appendicitis both before and after surgery. 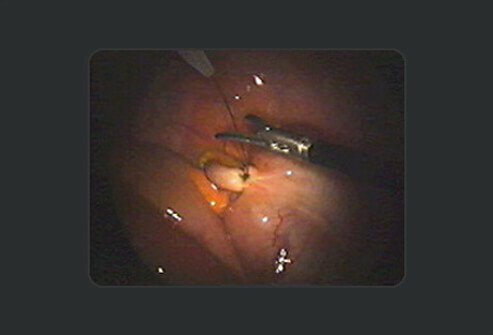 Appendectomies can be performed laparoscopically, where special surgical tools are advanced into the abdomen via several small incisions. The following is a step-by-step account of an appendectomy. Appendectomy: Step 1 of 8. 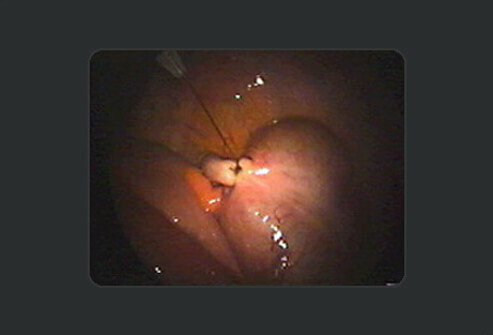 This image shows a normal appendix in a female patient undergoing surgery for an infection in her reproductive system. 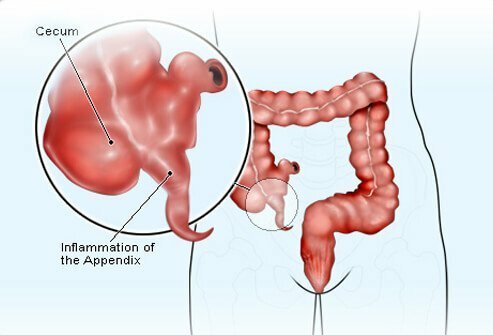 Since there is no known function of the appendix and to prevent diagnostic confusion in the future, the surgeon removes it to prevent potential appendicitis in the future. Appendectomy: Step 2 of 8. To remove the appendix, the surgeon separates it from the mesentery, which is the tissue that delivers blood to the area. Electric current delivered by an instrument called a bipolar forceps is used to seal (cauterize) the blood vessels and prevent bleeding. Appendectomy: Step 3 of 8. In the next step, the surgeon uses scissors to snip the appendix free from the mesentery. 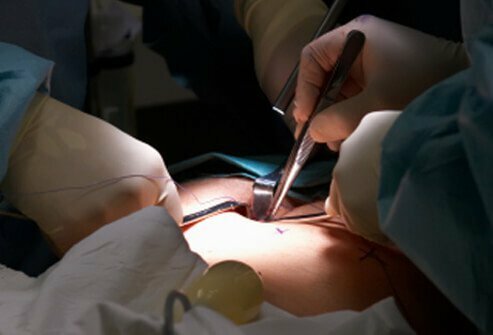 He alternates between electrocautery (to seal blood vessels) and cutting to completely separate the appendix from the surrounding tissues until the only remaining connection is to the colon. Appendectomy: Step 4 of 8. In the next step, the surgeon crushes the base of the appendix with a clamp and then moves the clamp slightly towards the end of the appendix, positioning a pre-tied suture at the base of the appendix to tie it off. Appendectomy: Step 5 of 8. The surgeon tightens and secures the suture using a fisherman'’s knot, which can be tightened but is incapable of loosening by itself. Appendectomy: Step 6 of 8. The surgeon then uses the scissors to cut the suture above the knot. Appendectomy: Step 7 of 8. The surgeon cuts the appendix with the same scissors above the knot but below the clamp to prevent contamination. Appendectomy: Step 8 of 8. The surgeon and his surgical team complete one final inspection of the area to ensure there is no bleeding. 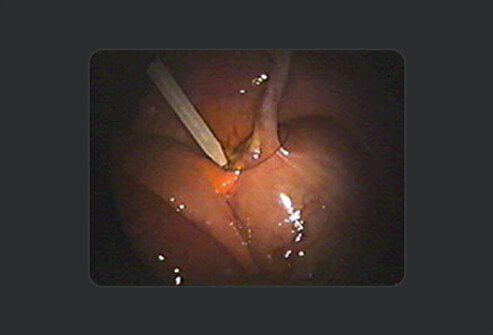 Are there complications and/or long-term consequences of appendectomy? 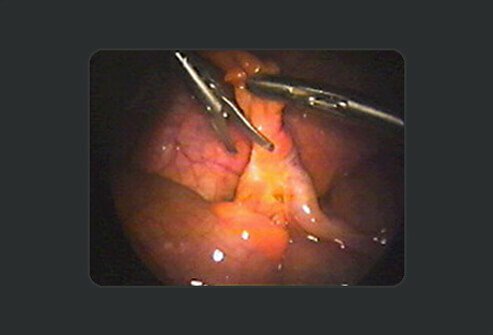 Infection at the surgical sites is the most common complication associated with an appendectomy. Redness and pain may be present with a mild infection. 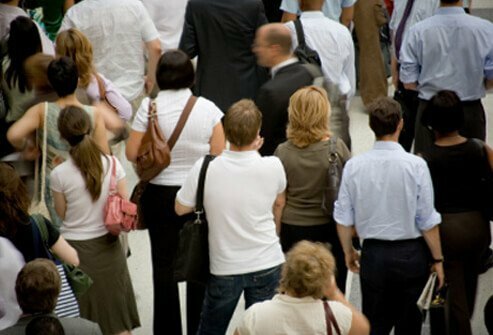 Moderate infections may have more severe symptoms. Antibiotics are used to treat mild-to-moderate postsurgical infections. If an abscess develops, drainage may be necessary. 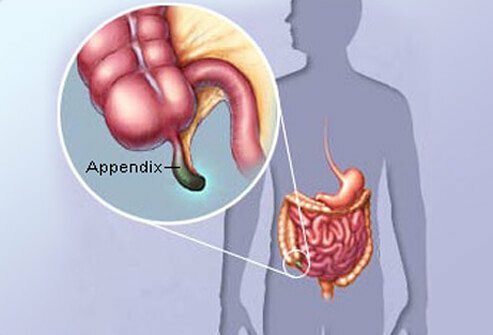 The appendix plays an uncertain role in adults and older children. 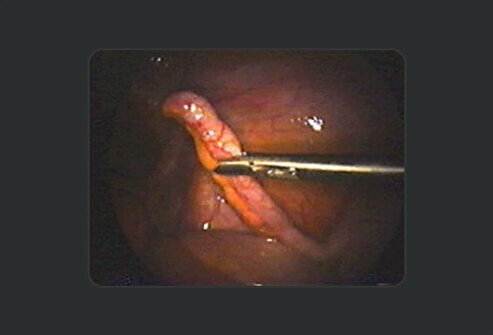 Removal of the appendix is not associated with any major long-term health problems. Some studies report an increased risk of certain diseases after an appendectomy. Crohn’s disease, which is an inflammatory intestinal condition, is one such disease. American College of Surgeons:"Appendectomy: Surgical Removal of the Appendix." National Institute of Diabetes and Digestive and Kidney Diseases (NIDDK): "Appendicitis."